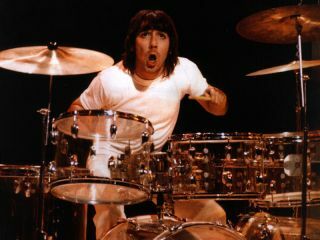 Who drummer Keith Moon is to be honoured with a "blue plaque" at one of the former sites of London's Marquee Club. The venue played host to The Who on many occasions during the '60s. The plaque will be unveiled in March by Moon's former Who bandmates Roger Daltrey and Pete Townshend. It's a turnaround in fortune for Moon fans. In May 2008, English Heritage declined to mark Moon's London home with a blue plaque, saying: "Moon died aged only 32, and many of his contemporaries, including other members of The Who such as Pete Townshend, are still living. Further time should be allowed to pass so he can be considered alongside his contemporaries." But now another British heritage organisation, the Heritage Foundation, has sanctioned a plaque. "You don't get characters like him any more"
The Heritage Foundation's David Graham told the UK's Independent newspaper: "Keith has been overlooked but was such a character - you don't get characters like him any more. We were delighted to organise a plaque for Keith, and the Marquee is the perfect place because it was at the centre of the rock gigs in London." Question: who knew there were so many 'heritage' people desperate to throw blue plaques around, eh?